This space math adventure app is geared specifically to the 3-4 year old set. Kids get to help the peppy robot, Zorbit and his pal get to planet Earth while they build they pre-K math skills. The adventure is divided into six different chapters that focus on Common Core Curriculum for preschool math—love that. Kids have to complete each chapter and earn a star before they can move on to the next one, once all the stars are earned, Zorbit’s space ship can head to Earth. Educational Apps with long term goals are some of our favorites! There are also sticker rewards at the the end of each chapter, a perk that never seems to lose its luster to a three year old. Chapter 1 introduces the numbers 1 through 5 as kids count groups of objects. Chapter 2 addresses number order from 1 to 5 and then the numbers 6-10 are introduced. Chapter 3 moves into number recognition for the numbers 6-10, counting from 1-15, the concepts of inside vs outside and more vs less. Chapter 4 moves the counting up to 20 and asks kids to arrange numbers from smallest to largest and vice versa. Chapter 5 moves into basic geometry with shape recognition, wide vs narrow, long vs short and tall vs short. The final chapter has kids build and decorate the space ship that will soon head to Earth. It’s fun, it’s comprehensive and it takes a little while to complete, which makes it a great rainy day or travel app. The only thing I have to say about it, is one section that uses a lot of potty humor. We’re down with the silly bodily function noises, but even my three year old thought it was a bit over the top! 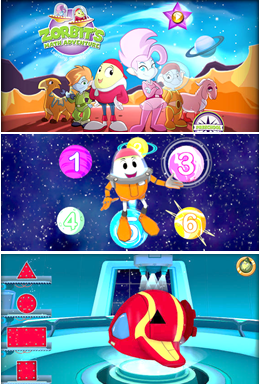 Zorbit’s Math Adventure Preschool works on iPhone, iPod and iPAD. It is $3.99 on App Store. If you want to try it out, there is a Lite version that is free.